Located on Candolim Beach, this resort offers rooms and suites with 24-hour room service and courtyard or sea views. It boasts 3 dining options, a spa and an outdoor pool. The O Resort & Spa, modern rooms feature hardwood flooring and designer furniture. They are equipped with a flat-screen TV with cable channels and a minibar. Private bathrooms come with a bathtub and rain shower. O Resort & Spa is 35 km from Thivim Railway Station and 48 km from Dabolim Airport. An airport shuttle service is available. Guests can exercise in the fitness centre or take a dip in the hot tub. They can also relax in the sauna or make an appointment with the barber/beauty shop. Candolim Beach offers water sports such as parasailing and jet skiing. Kitsch serves a buffet spread of international dishes, while Harajuku serves Asian delights. Alternatively, Adda restaurant offers local specialities. Wired internet is available in the hotel rooms and costs INR 317 per hour. One child under 12 years is charged INR 1171.50 per night and person when using existing beds. 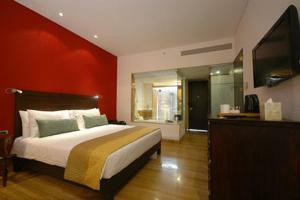 One older child or adult is charged INR 2343 per night and person in an extra bed. Maximum capacity of extra beds in a room is 2. Any type of extra bed or child's cot/crib is upon request and needs to be confirmed by the hotel. Supplements will not be calculated automatically in the total costs and have to be paid separately in the hotel.